I love cheese. Ever since I was a little kid, I would never say no to cheese. Since I never really fancied regular milk, I guess my daily intake of calcium was satisfied by the fermented kind. I'm no cheese expert by any means; but I do eat it and like it. In fact, there are very few cheeses I dislike. 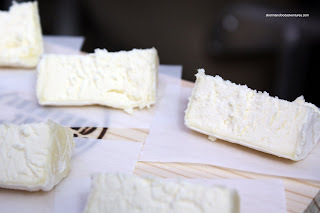 Today, as part of our activities for the Foodbuzz Blogger's Festival, I signed up for the Cowgirl Creamery cheese tasting. Prior to this session, I'd already had a meat cone from Boccalone Tasty Salted Pig Parts and food from Out the Door in the Ferry Marketplace. Hungry I was not. As I was waiting for the cheese to be setup, I moved in to take my requisite photos. Naturally, everyone else followed suit. It's so cool that I'm not the only wacko taking pictures of cheese. I felt comfortable, a sense of belonging and most of all, no shame! Sue Conley along with Peggy Smith opened Cowgirl Creamery in 1997 in Pt. Reyes which is an hour north of San Francisco. Today, we were lucky to have Sue running the cheese tasting session. I was in awe of her knowledge and sensibility while discussing the roots of her company and the process of making cheese. There is more than curdling milk! We started with the most basic of cheeses - Fromage Blanc. They take Albert Straus milk and heat it to 185 degrees. To it, they add renet, acid, salt and creme fraiche. The result is a creamy, slightly tart soft cheese. It went really well with the accompanying crunchy crackers. 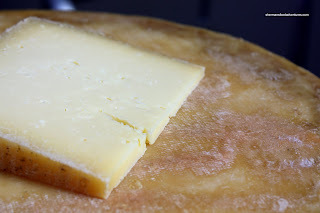 The next cheese we sampled was Inverness which is made with milk that is high in fat and protein. Sue stressed that milk needs to be made into cheese within 48 hours because the proteins start to break down after that. With the high fat content, the cheese is naturally smooth and creamy. I found it slightly gamy and had a strong aftertaste. 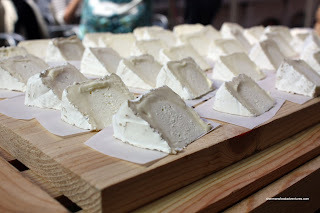 By far, the creamiest cheese we tried was the Mt Tam, which is an aged cheese. It is also made of Albert Straus milk; in fact, they add more cream to it (triple cream to be exact). It tastes a lot like Brie and was quite rich. Sue said that they use the same process as making Gouda for Mt Tam. The last cheese we sample was the Batch 11, which is an experimental cheese that has not been released yet. Along the same lines as Asiago, it has a strong taste and it was a bit dry. Not exactly s mooth, it exhibited an earthy, nutty flavour. It is also made with Albert Straus milk and is targeted to be less expensive than most other similar cheeses. Definitely an interesting session and now I know more about the cheese making process thanks to the Cowgirl Creamery. You might be happy to know that we (Everything Cheese, a new cheese store here in Edmonton) will be able to bring in Cowgirl Creamery's cheeses! We visited their production site just outside of San Francisco last year and were able to sample all of their wonderful cheeses so we are so excited that very soon we'll be able to bring them to you! HCL, thanks for the tip! Next time I'm in Edmonton, I'll look you up. Yum!